Granulomatous inflammation consists of collections of macrophages, epithelioid macrophages, and sometimes lymphocytes around a nidus such as the tubercle bacillus, Schistosoma mansoni eggs, or other foreign material (usually particulate). This type of inflammation can be classified according to cell type, organization, whether it exhibits low turnover or high turnover, or whether it is nonimmunologic (foreign body) or immune based. All these aspects have been described in recent reviews.1,2 An important example of granulomatous inflammation is tuberculosis, for which the pathology has also been extensively described. 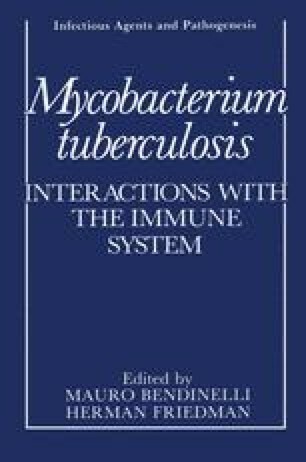 In tuberculosis, the development of granulomatous inflammation is a host response to the tubercle bacillus that is probably beneficial in augmenting the killing of Mycobacterium tuberculosis and in sequestrating the organisms to prevent dissemination. However, in tuberculosis as well as other granulomatous diseases, granulomatous inflammation is clearly a two- edged sword, since it also results in extensive inflammation, necrosis, calcification, and fibrosis. The maximal development of granulomatous inflammation in tuberculosis is probably dependent on inflammation induced by the development of delayed hypersensitivity to antigens of the tubercle bacillus. Indeed, it is this immune response that is primarily responsible for producing activated macrophages responsible for controlling the growth and pathogenesis of M. tuberculosis.